Last week, a friend of mine insisted that I watch Disney's 1941 version of The Reluctant Dragon. The results were disastrous, as immediately after watching it I found myself doodling scads of goofy, effeminate serpents. I settled on one I really liked and then, for reasons I will never be able to truly comprehend, decided that I wanted to add tons and tons of details. 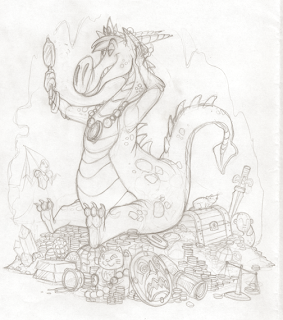 Treasure, for example—After drawing a number of piles of coins, it occurred to me that although drawing lots and lots of the same thing over and over again is a bit aggravating, it would be even more aggravating to paint those things. I scoured the portion of my mind that values shiny material possessions for ideas, and failing that, I did an image search for "treasure." It didn't help! So now there's STILL a ton of coins all over, but I'm not going to pull my hair out when I get around to painting them. ...Maybe. We'll see. So! Here it is, in all its unfinished glory. When I go into these paintings lately I like to test out the colors on a scrap of paper, which is helpful when I'm trying to come up with a color scheme or figure out how I'm going to layer the paint. 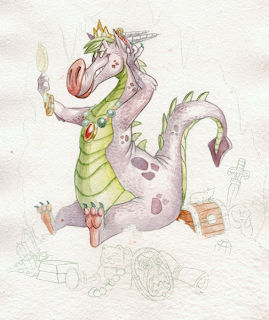 I was initially hesitant to paint the guy purple, but then I slowly came to the realization that there is no other color more appropriate for narcissistic fantasy creatures! I understand that painting the coins is daunting. You probably want to find a solution for yourself, but I wanted to suggest that you think of the coin pile more as a cloud, focusing on the range of gold tones (with some purples/blues, etc., in the shadows)to give the sense of shape and size. You don't need to agonize over individual coins. The partial outline of a coin here and there, perhaps in the foreground, would be suggestive enough. Also, an occasional highlight (white paper) would suggest the glint of coins. Anyway, good luck resolving this. I spy a lucky cat with one raised paw!